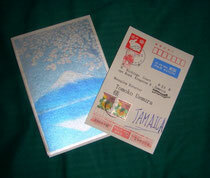 New year's card reached today from Japan a long way. Post mark is Dec 18. It tooks 1 month. It's seems have long great journey. Welcome to Jamaica! Thanks friends.